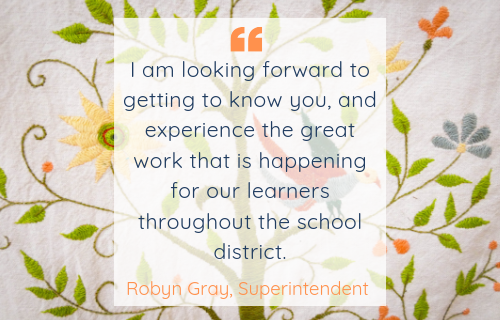 Letter of Introduction from Robyn Gray, our new Superintendent for the Cowichan Valley School District. I am very excited to be starting my new role as the Superintendent of the Cowichan Valley School District and I am looking forward to getting to know you, and experience the great work that is happening for our learners throughout the school district. I wanted to take this opportunity to introduce myself. I have been in education for over 25 years. I have been afforded the opportunity to work in all areas of K-12 education, as well as being in a leadership role at schools and at the district level for many of those years. Much of that time has been spent as your next-door neighbor in the Nanaimo-Ladysmith Public Schools. When not at work, I’m busy spending time with my family, including my two children and grandchild. We spend a lot of time at the baseball fields, hockey rinks, and just being outdoors in our beautiful island environment. This spring I’m planning on visiting our schools and taking the time to meet with our learners, dedicated educators, support staff, parents, and school communities. Over and above that, my focus is going to be on working with the School Board to help realize their strategic priorities. Through the enhancement of current district programs and the creation and implementation of additional programs we will continue to build educational excellence for all our learners. I have a strong background in areas that I believe everyone in this district is passionate about, and I am eager to work with our district community in our schools throughout the Cowichan Valley. I feel heartened that our learners have the opportunity to be working with such a devoted team of educators, school-based and district leaders, and support staff as we continue to transform our district for their benefit. Thank you, and I look forward to meeting you in the coming months.